I met him at Jack Russell Memorial Stadium in Clearwater, Florida in 1995, when the Cincinnati Reds, whom he was the hitting coach for, came to play the Philadelphia Phillies in a spring training game. I had met his son, Brian, the previous year. I remember this day for a couple of reasons. First, it was a day/night doubleheader. A noon game between the St. Petersburg Cardinals and the Clearwater Phillies of the Florida State League, which I attended, followed by a spring training game between the Cincinnati Reds and the Philadelphia Phillies, which was being broadcast nationally on ESPN. Second, it was April 19, 1995, the day of the Oklahoma City bombing. 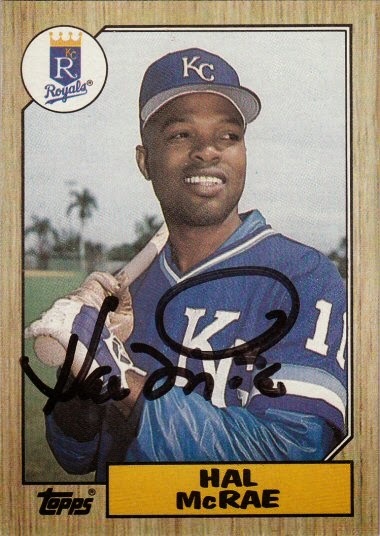 Hal signed a 1987 Topps card #573. Normally, I'd be posting a non-sports card related autograph on Friday, but when I started this site in 2013, I underestimated how many non-sports card related autographs I had compared to how many Friday's there would be. Looking back, I should have kept those to a monthly occurrence. Nevertheless, for the foreseeable future, it'll be all cards everyday of the week, all in the order of how I acquired them.